Los Angeles County Bicycle Coalition Executive Director Tamika Butler speaks on Los Angeles’ new Vision Zero policy at today’s signing ceremony in Boyle Heights. Photo: Joe Linton/Streetsblog L.A.
Today, Los Angeles Mayor Eric Garcetti signed a directive [PDF] that commits city departments to Vision Zero. Specifically, the City of Los Angeles is committed to reducing traffic fatalities to zero by the year 2025. Vision Zero is a worldwide movement, started in Sweden, to eliminate all traffic deaths. While traditional traffic safety campaigns have focused on changing human behavior to reduce accident risks, Vision Zero takes a fundamentally different approach by instead putting the responsibility on government to manage the streets using evidence-based strategies to prevent fatalities and serious injuries. Vision Zero is data-driven, outcome-focused, and collaborative across agencies and departments. Today’s directive follows on the heels of, and broadens, other recent L.A. City Vision Zero declarations. Last September, the Department of Transportation (LADOT) adopted Vision Zero as part of its departmental strategic plan. In April, Garcetti released an ambitious Sustainability “pLAn” that included Vision Zero. Earlier this month, the L.A. City Council approved Mobility Plan 2035; that approval made Vision Zero the adopted citywide policy for Los Angeles. Prior to today, Vision Zero was largely confined to LADOT and City Planning (DCP). With this new directive, Garcetti broadens the city agencies responsible for implementing Vision Zero. In addition to LADOT and DCP, Garcetti explicitly names the Police, Fire, Public Works, and Water & Power departments to participate in an internal city of L.A. Vision Zero Steering Committee. In addition, the city will host a broader Vision Zero Task Force, to include city representatives, plus L.A. Unified School District, L.A. County Department of Public Health, Metro, non-profit advocates, and others. Representing this broadening, Garcetti was flanked by City Councilmembers Mike Bonin and Mitch Englander, and high-ranking representatives from LAPD, LAFD, LADOT, and the Department of Public Works. Rounding out Vision Zero proponents joining the mayor were community groups including the Los Angeles County Bicycle Coalition, Los Angeles Walks, and others. Garcetti’s directive establishes an interim goal of reducing traffic fatalities by 20 percent by 2017. Initial City of Los Angeles Vision Zero activity will focus on a High-Injury Network, billed as 6 percent of L.A. streets where 65 percent of all deaths and severe injuries take place. Find the city’s High Injury Network mapped here. Additionally, the initial focus will be on pedestrians, especially old and young. It is good news for Los Angeles’ livable future with the city joining a growing number of North American cities that have embraced Vision Zero. Now that a great vision and concrete goals are in place, the devil could be in follow-through details. In other Vision Zero cities, including San Francisco and New York City, implementation sometime strays from the priorities that can really save lives and end traffic violence. Los Angeles would never let local politics get in the way of safe streets, would it? The key here is actually the Fire Dept, which continues to insist on wide turn radials and super-wide streets for fire trucks – even though there’s no reason they can’t move just as quickly on roads that are slightly narrower. In fact, as SBLA readers know already, having bike lanes and other street space that isn’t filled up with cars actually enables emergency responders to move faster than the current arrangement of our streets. But whether or not anyone at LAFD recognizes this is an entirely different question. Zero vision sounds more like it. These people know that there’s never going to be such thing as zero traffic accidents. It’s unachievable just like saying let’s get rid of every single car off the road in LA, ain’t gonna happen. But you know the mantra, just say “if it helps but save one life” and you get nanny state laws. Well, they’re not officially aiming for zero traffic “accidents” (though that would be nice too), but rather zero traffic deaths. There are only three factors needed to achieve Vision Zero: Political Will. Political Will. Political Will. Our Mayor has the vision. We know that. He says great things and has great ideas, but is notoriously averse to fighting for something and following through with his ideas. Other US cities have been bogged-down by resistance from within their departments, even with data proving the concept. If Los Angeles hopes to achieve Vision Zero it’s going to take a level of dedication and leadership that has so far eluded the Garcetti administration. It’s telling that today’s signing was held on a side street in Boyle Heights, and not in the middle of one of Los Angeles’ most deadly streets, such as PCH, Hollywood Blvd, Roscoe Blvd, Western Ave, Crenshaw Blvd, Broadway or even Figueroa Street. I fear mocking this unrealized directive for the next ten years, or worse, become one of its statistics. It’s about saving hundreds of lives, and besides that, it makes life nicer when you don’t worry about being killed on the street while cycling/motorcycling/walking/driving/rollerblading/whatever-ing. Political will (scoff). Ain’t gonna happen. Too much special interests. Just look at government trying to put more regulations toward Uber and Lyft despite no one is asking for such stricter regulations. Obviously, you’ve never driven a fire apparatus. It is a trade off that society has to grapple with – narrower, slower, safer streets means slower fire department response time. Wider, faster, less safe streets means faster fire department response time. Both extremes means that someone dies. Where can we meet in the middle? Whether or not I’m one of the few to have driven a fire apparatus, the difference between a 100′ wide street and an 80′ wide street is not terribly concerning. Let’s play this out a little further, shall we? Let’s design our streets to maximize emergency response time. So, 30′ turn radials (curbs cut back another 4-5 feet at corners) and even wider vehicle travel lanes (how about 14′ wide as the standard?). Now, those handful of times that a fire apparatus needs to use the streets, it will probably have a slightly improved response time. And the other 99.99% of the vehicles using the streets? They’ll be traveling at faster speeds, causing more collisions, creating much more life-threatening scenarios, and, as a result, increasing the need for those emergency responders. I get that it’s a trade-off and don’t mean to imply some cavalier approach here. Designing fire trucks differently, perhaps? Zero traffic deaths? While it is a laudable (utopian) goal, it is impractical to achieve without significant improvement to existing infrastructure first (light rail on old red line right of ways instead of bus lanes). As it stands, a select few (read bike coalition etc.) with their own selfish interests are trying to dictate how the City will operate in the near future. Taking lanes from cars and giving them to buses and bikes only forces people into fewer travel lanes. It will cause people and businesses to flee the City (which will inadvertently help achieve the Vision Zero goal), not adapt to mass transit and bicycles to get around. This City runs on its migrant commuter population. To exclude them in this plan only invites disaster (and gridlock) for the City. The City was designed around personal transportation. Yes, it can be changed, slowly, and with the cooperation of its residents. To try and reshape it all at once is like cutting your feet off to change your shoes. Haven’t you heard? We must dispatch a Fire Engine, a Crash Truck (Paramedic Truck) and an Ambulance to each and every medical call for help to 911. Can we be real here for a second? To actually achieve vision zero, you’d have to change the speed limit on ALL streets to 25 MPH, beef up enforcement significantly and have draconian penalties for speeding, DUI and distracted driving. I’m serious. Would I be willing to live in that world? Yes, because the amount of people who die on our roads is a disgrace. Would a majority of people in LA be willing to accept that? I doubt it. Even if every arterial street in LA had a protected bike lane, if you have cars driving at “normal” speeds people are going to die, period. Vision zero sounds great as a slogan, but I don’t think we’ve yet had a serious conversation about the SPECIFIC measures that would be necessary to achieve it. If you really care about literally achieving vision zero move off of the fluffy slogan and have the hard conversations about specific changes. Well, before it’s approved policy, people aren’t talking about specific measures… so it’s chicken and egg. Changes will take time, and there may be things we can’t see from where we currently sit. If it turns out to be – in your words – unrealistic, and we only reduce deaths by 80% or 50% would that be so awful? Can go both ways. You can’t for example, say we respect the 14th Amendment, but say no to the 2nd Amendment. The left is responsible for the latter one. No, that would be great, but I worry that it’s easy to agree with a non-specific slogan like “vision zero” or “smart growth,” but when you get down to details you risk losing support. Yet, without specific measures, its just a feel-good aspiration that can’t amount to anything. This is the worst idea yet. Which one of these politicians uses public transportation or bikes and walks? Have any of these politicians been on a city bus lately? These idiots are putting bike lanes in low income neighborhoods where no one uses them. They are removing traffics lanes causing traffic nightmares. There will be more deaths, not less. People running red lights and jaywalkers are not a good mix. Then on top of removing traffic lanes, they are approving real estate developments causing the population density to rise in neighborhoods that are already too dense. Its bad enough they’re going to have a metro rail going down the middle of Crenshaw Blvd. I’m opposed to all of their bad ideas. This city is going downhill fast. They have no money to repair streets and aging water mains, but they want to host the Olympics and build another 2 billion plus dollar jail. They said building the twin towers would solve the jail problem. Its built, but citizens are still being abused at outdated Mens Central. We need all new city leaders, instead of the musical chairs these same old politicians have been playing for the last 30 years. Mayor Garcetti’s vision zero column says a whole lot of nothing. Doing studies and forming commissions should have been done “BEFORE” you started messing up this cities traffic. Can’t wait to vote him out. One term like J. Hahn. Thanks for your concerns. It can be quite easy to focus on the negative, and I agree the plan is far from perfect, but I would urge you offer better solutions or perhaps offer examples of cities that have better transportation networks than Los Angeles and share how you might think we can achieve a better transit system. Should Los Angeles emulate cities such as Huston, Texas or New York City, or do something in between? Or something radically different? The status quo has not served us well, I would love to hear your solutions. Yeah, traffic laws are just part of the nanny state. It’s my Constitutionally-protected right to drive however I see fit. Police enforcing government standards on my driving is just another example of state force against the liberty of the individual. Remove the bike lanes and replace them with traffic lanes. The Wilshire corridor has no parking during specific hours. This should be applied to all high traffic corridors. Remove the toll on local freeways. The money is obviously not being used to fix the streets or water mains. Finish synchronizing the traffic signals or synchronize more. All metro rails should be elevated at all major thoroughfares. Left turn only signals should last longer. Remove “no right on red” signs at intersections that don’t require them and are only there to ticket unsuspecting drivers. I’m only focusing on whats in front of me and it happens to be negative. A study published in the LA Times last July found that almost 25% of pedestrian deaths occur at less than 1% of the city’s intersections. Wouldn’t it be more effective (not to mention efficient) to address the issues at high-accident locations, rather than adopt these ridiculous, pie-in-the-sky measures that will only make life in L.A. more miserable? There were 99 traffic-related pedestrian deaths in L.A. in 2012, a figure referred to as “high” by the Federal officials making the announcement — although it was far behind the lead city, New York, which had 242 traffic-related pedestrian deaths in the same year. I am NOT saying their lives didn’t matter, but when you consider the first point in my post, and also consider that we’re a city of about 4 million people, which swells to around 6 million with the influx of commuters, the proposed program starts to look like a cover for some other goal. And I have no doubt that it is. Zero traffic fatalities is an aspirational goal that may or may not be met. The important thing is that the city is adopting a systems-based, data-driven approach to traffic safety that rejects the defeatist attitude that death and serious injury are unavoidable or acceptable consequences of our transportation system. If we truly care about safety and make preventing death and injury our highest priority, we *will* see significantly fewer people hurt or killed. And it doesn’t have to come at the cost of mobility — Sweden, for example, has made huge safety gains using this approach in the last couple of decades even as vehicle travel has increased. 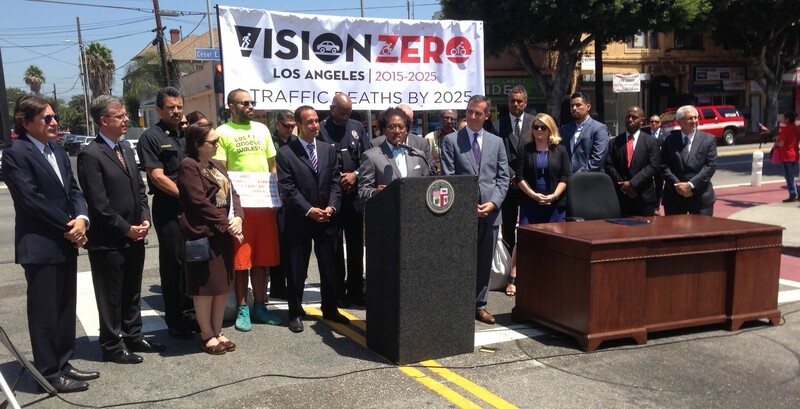 L.A.'s Vision Zero efforts are two years old today. The programs have a mixed record of achievement toward the target of zero traffic deaths. Garcetti has proposed $16.7 million for Vision Zero, livability advocates are urging $80 million for the program.